Luis Alberto Barrera is a Dean’s Honored Graduate in the fields of Physics and Mathematics. He is a member of Phi Beta Kappa and has received many scholarships and awards during his time at UT, including the Thomas and Elizabeth Merner Scholarship in Natural Sciences, the Ira Lon Morgan Endowed Presidential Scholarship in Physics and the Melvin J. Rieger Scholarship in Physics. He was also named a Williams Scholar by the UT Mathematics Department. As we can see from his degrees, certificates and research areas, Luis has not been confined by one area of science. In his time here at UT, he has been involved in several vastly different fields of study. He has found and created ways to combine these fields and establish himself as a leader in the cutting-edge areas where they overlap. He has earned a B.S. in Physics, a B.S. in Mathematics and a Certificate in Computational Science and Engineering. He has also been closely involved with biology and medicine. His current paper examines work carried out at Harvard Medical School. It seeks to understand the evolution of transcriptional regulatory networks in yeast. His other areas of research have included particle physics and influenza epidemic simulations. Although his mentors come from many different fields, Luis say his most influential mentor has been Dr. George Shubeita. Together Luis and Dr. Shubeita have developed methods to study the regulation of microtubule-based cargo transport in Drosophila. 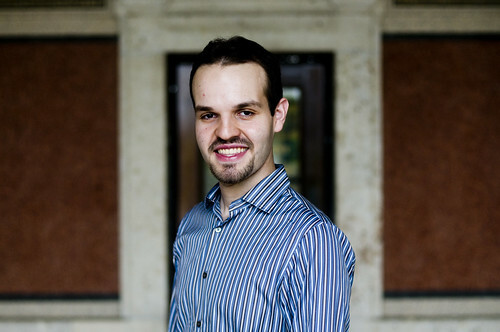 Luis’s research here at UT indicates that he will go on to apply his broad span of knowledge and build bridges of understanding between physics, mathematics, biology and medicine. In the coming fall Luis will keep integrating multiple areas of study. He will enroll jointly in the Harvard Biophysics program and the Bioinformatics and Integrative Genomics program at the Harvard-MIT Division of Health Sciences and Technology. He has received an NSF Graduate Research Fellowship as well as the James Mills Peirce Fellowship from the Harvard Graduate School of Arts and Sciences to continue his own original research. In keeping with his interest in the overlap of multiple areas of science, Luis has selected Rob Phillips’s Physical Biology of the Cell for his book award. Luis is one of this year’s student speakers.